Do aliens really exist ? Or are they just a concept that movies like to tease us with, just to titivate our minds and captivate our souls. God knows! Or better yet, nurses, doctors, astronautical personal, and psychiatrists. Yep. I said 'psychiatrist'. As seen in this film Directed by Iain Softley; and Starring: Kevin Spacey with Jeff Bridges. It was made in 2001, and lasts for 121 minutes. 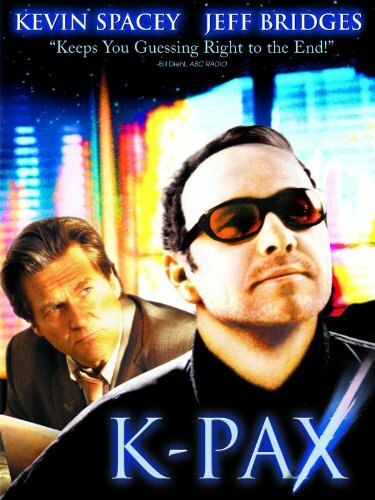 OK, so what would you do if some chap wearing sun-glasses named Prot (Kevin Spacey), popped up out of nowhere, and then claimed that he was a extraterrestrial from the planet 'K-Pax'? Correct. You'd send this nutter to a Psychiatric Institute as soon as possible. However, what would you do if this said same nutter, Prot, was also able to provide precise answers to questions about himself, K-Pax, the stars, and somehow managed to have a calming affect on the patients around him as well? That's what his psychiatrist, Mark Powell (Jeff Bridges), wants to know, when he begins to evaluate him at the Institute. Oh! And do you know what is even strange still? Is that every time Mark queries Prot's summations with people associated with the field he's talking about -- astrophysicists for example -- not only is he correct in what he says, but he also reveals something that leads them to finding out more able the universe. Ha! No wonder his fellow patients believe Prot when he promises to take one of them with him when he returns to his home-world of K-Pax -- the date, July 27th. Though, Mark believes that this date is connected to Prot's life somehow, signifying to him that this was when Prot most probably suffered a severe psychological trauma, causing his current state of mind to be what it is. Therefore, Mark then decides to regress Prot with hypnosis, just so he can glean information on who he was and where he came from -- a session at a time. And do you know what? Mark's gambit works! He discovers that Prot is a man called Robert Porter who was presumed dead since July 27, after attempting suicide due to his wife and daughter being murdered by a mad-man. But, I am afraid to say, that when Mark confronts Prot with this knowledge, he just dismisses it, claiming that Robert is ‘not he’. Huh? Though that is most probably why what next transpires commences on the date in question – July 27. As aliens rise - humans fall - revelations are made - and nothing is really real on this old mud-ball. Alright, I have to confess, that 'K-Pax' is a film that is very hard to classify. I know that I've filed it under science-fiction myself. But then again I suppose I could have also filed it under drama, mystery, adventure, or even comedy. Now I say all of this because in some strange way this movie is a science-fiction bent narrative with dramatic, adventurous, dramatic, and mysterious overtones to it. Personally speaking of course, I feel that this flick doesn't want to put itself 'into a box' really. Though why should it, huh? I find that the genesis of this film -- just like it's classification -- is all about the nature of perception. Well, why should we -- as a society -- just label everything we see just because it’s the done thing to do? No - I don’t think so either. Anyway, enough about what this film isn't. What about what this film is? Is is any good or what? No question about it - yes - yes it is. It’s handled masterfully under director, Ian Softley's, creative and somewhat artistic direction. Because he is able to capture an almost ethereal quality both on the screen and in the performances. Kevin Spacey and Jeff Bridges act superbly in this piece too. Giving a understated yet vibrant feast on film, whilst adding a new dimension to the patient / doctor relationship. Also, all of the other casts members have to have a notable mention as well. As they enhance the overall story, making it richer in tone, plot, and concept. Hey! Funnily enough, this last point -- concept -- is what is at the heart of this movie you know. Why must we as a race feel that we are the only ones 'living' in this solar-system? Why does our perception of alien lifeforms derive from many media slanted sources? If scientists have proven that the universe is billion and billion of years old, why should we presume that our planet is the only one that can sustain life, and evolve as a race? Interesting concepts to ponder on, right? And this movie does not even try to answer it. Well, why should it? The idea alone is more than enough in itself, giving us -- as human beings -- a notion that we may or may not ever really figure out. But I tell you what we can figure out! 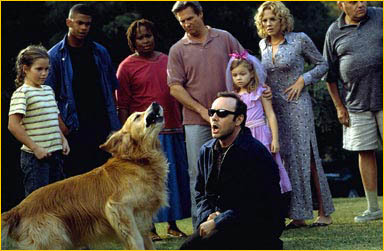 Filmic facts: (1) The makers of 'K-Pax' were sued by the makers of 'Man Facing Southeast' in 2001. The complaint was later withdrawn due to the actions of the author of this movie. (2) Ian Softley's directorial debut was in the Beatles movie 'Backbeat'. (3) This film was based on a book written by Gene Bewer, www.genebrewer.com, who has written the a 'Prot Trilogy'. (4) Kevin Spacey is the Artistic Director of the Old Vic Theater in London, England. (5) In the books, Prot's favorite film is 'Starman', which Jeff Bridges starred in. (6) Ian Softley was educated at St Benedict's School, London, which was near the famous Ealing Studios. (7) Originally this film was going to star Will Smith as Prot and Kevin Spacey as Dr Mark Powell. (8) Jeff Bridges can play the guitar, and he was once considered for the part of Travis Bickle in Martin Scorsese movie 'Taxi Driver'. (9) The yearbook picture of Robert Porter was from Kevin's 1977 yearbook. And (10) The bananas eaten in this film were real. All in all 'K-Pax' is one of those films that reminds me of a mixture of 'E.T. ', 'Good Will Hunting', and 'Starman'. As it is able to juggle dramatic, science fiction, and adventurous based elements -- all at the same time -- and present to us with a concept that is always a pertinent one to explore. Are we the only species in the universe that can live life and do whatever we do? I think not. All you have to do to know this is look up into the stars.